It's one of the most used, and most misunderstood, signal processors. While people use it to make a recording "punchier," it often ends up dulling the sound instead because the controls aren't set optimally. And it was supposed to go away when the digital age, with its wide dynamic range, appeared. Yet the compressor is more popular than ever, with more variations on the basic concept than ever before. Let's look at what's available, pros and cons of the different types, and applications. Fig. 1: The first, black section shows the original audio. The middle, green section shows the same audio after compression; the third, blue section shows the same audio after compression and turning up the output control. Note how softer parts ot the first section have much higher levels in the third section, yet the peak values are the same. Even though digital media such as the CD have a decent dynamic range, people are accustomed to compressed sound. Compression has been standard practice to help soft signals overcome the ambient noise in typical listening environments; furthermore, analog tape has an inherent, natural compression that engineers have used (consciously or not) for over half a century. There are other reasons for compression. With digital encoding, higher levels have less distortion than lower levels—the opposite of analog technology. So, when recording into digital systems (tape or hard disk), compression can shift most of the signal to a higher overall average level to maximize resolution. Compression can create greater apparent loudness (commercials on TV sound so much louder than the programs because they are compressed without mercy). Furthermore, given a choice between two roughly equivalent signal sources, people will often prefer the louder one. And of course, compression can smooth out a sound—from increasing piano sustain to compensating for a singer's poor mic technique. Compression is often misapplied because of the way we hear. Our ear/brain combination can differentiate among very fine pitch changes, but not amplitude. So, there is a tendency to overcompress until you can "hear the effect," giving an unnatural sound. Until you've trained your ears to recognize subtle amounts of compression, keep an eye on the compressor's gain reduction meter, which shows how much the signal is being compressed. You may be surprised to find that even with 6dB of compression, you don't hear much apparent difference—but bypass the sucker, and you'll hear a change. Threshold sets the level at which compression begins. Above this level, the output increases at a lesser rate than the corresponding input change. As a result, with lower thresholds, more of the signal gets compressed. Ratio defines how much the output signal changes for a given input signal change. For example, with 2:1 compression, a 2dB increase at the input yields a 1dB increase at the output. With 4:1 compression, a 16dB increase at the input gives a 4dB increase at the output. With "infinite" compression, the output remains constant no matter how much you pump up the input. Bottom line: Higher ratios increase the effect of the compression. Fig. 3 shows how input, output, ratio, and threshold relate. Fig. 2. The threshold is set at -8. If the input increases by 8dB (e.g., from -8 to 0), the output only increases by 2dB (from -8 to -6). This means the compression ratio is 4:1. Attack determines how long it takes for the compression to take effect once the compressor senses an input level change. Longer attack times let through more of a signal's natural dynamics, but those signals are not being compressed. In the days of analog recording, the tape would absorb any overload caused by sudden transients. With digital technology, those transients clip as soon as they exceed 0 VU. Some compressors include a "saturation" option that mimics the way tape works, while others "soft-clip" the signal to avoid overloading subsequent stages. Yet another option to include a limiter section into the compressor, so that any transients are "clamped" to, say, 0dB. Decay sets the time required for the compressor to give up its grip on the signal once the input passes below the threshold. Short decay settings are great for special effects, like those psychedelic 60s drum sounds where hitting the cymbal would create a giant sucking sound on the whole kit. Longer settings work well with program material, as the level changes are more gradual and produce a less noticeable effect. Note that many compressors have an "automatic" option for the Attack and/or Decay parameters. This analyzes the signal at any given moment and optimizes attack and decay on-the-fly. It's not only helpful for those who haven't quite mastered how to set the Attack and Decay parameters, but often speeds up the adjustment process for veteran compressor users . Output control. As we're squashing peaks, we're actually reducing the overall peak level and not taking advantage of the available headroom. Increasing the output level compensates for any volume drop. Basically, you turn this control up until the compressed signal's peak levels match the bypassed signal's peak levels. Some compressors include an "auto-gain" or "auto makeup" feature that brings up the output gain automatically. The hard knee/soft knee option controls how rapidly the compression kicks in. With a soft knee response, when the input exceeds the threshold, the compression ratio is less at first, then increases up to the specified ratio as the input increases. With hard knee (as shown in Fig. 2), as soon as the input signal crosses the threshold, it's subject to the full amount of compression. Bottom line: use hard knee when you want to clamp levels down tight, and soft when you want a gentler, less audible compression effect. Side chain jacks are available on many hardware compressors, and some virtual compressors include this feature as well. A side chain option lets you insert filters in the compressor's feedback loop to restrict compression to a specific frequency range. For example, if you insert a high pass filter, only high frequecies are compressed—perfect for "de-essing" vocals. Fig. 3. The Sonitus:Fx compressor module in action. 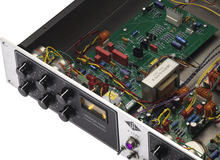 The link switch in stereo compressors switches the mode of operation from dual mono to stereo. Linking the two channels together allows changes in one channel to affect the other channel, which is necessary to preserve the stereo image. Fig. 3 shows the Sonitus:Fx compressor from Cakewalk's Sonar Producer Edition, which runs on Windows. This is a typical setting used for vocals. There was about -5dB of gain reduction at the moment this screen shot was taken, as shown by the GR (Gain Reduction) meter. There are the expected threshold, ratio, attack, release, knee amount, and output controls; this module also includes a limiter to control output transients, and an automatic release time control option called TCR. Compressors are available in hardware (usually a rack mount design or for guitarists, a "stomp box") and as software plug-ins for existing digital audio-based programs. Following is a description of various compressor types. "Old faithful." Whether rack-mount or software-based, typical features include two channels with gain reduction amount meters that show how much your signal is being compressed, and most of the controls mentioned above. Multiband compressors. These divide the audio spectrum into multiple bands, with each one compressed individually. This allows for a less "effected" sound (for example, low frequencies don't end up compressing high frequencies), and some models let you compress only the frequency ranges that need to be compressed. Vintage and specialty compressors. Some swear that only the compressor in an SSL console will do the job. Others find the ultimate squeeze to be a big bucks tube compressor. And some guitarists can't live without their vintage Dan Armstrong Orange Squeezer, considered by many to be the finest guitar sustainer ever made. Fact is, all compressors have a distinctive sound, and what might work for one sound source might not work for another. If you don't have that cool, tube-based compressor from the 50s of which engineers are enamored, don't lose too much sleep over it: Many software plug-ins emulate vintage gear with an astonishing degree of accuracy. Whatever kind of audio work you do, there's a compressor somewhere in your future. Just don't overcompress—in fact, avoid using compression as a cop out for bad mic technique or dead strings on a guitar. I wouldn't go as far as those who diss all kinds of compression, but it is an effect that needs to be used subtly to do its best. This article was originally published on Harmony Central. Reprinted with permission.